We’ll be BBQ’ing dogs, burgers and hot Italian sausage at the Tiki Bar in South Florida today, washing them down with Cuba Libres and other assorted niceties. Down here there are no seasons, so Memorial Day pretty much just means starting Tuesday the traffic will be lighter. 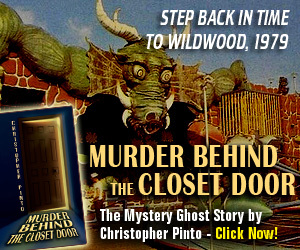 Up north, summer begins…the Jersey shore town boardwalks will crank up into high gear; soon the smell of caramel popcorn, suntan oil and pizza will fill the air 24 hours. 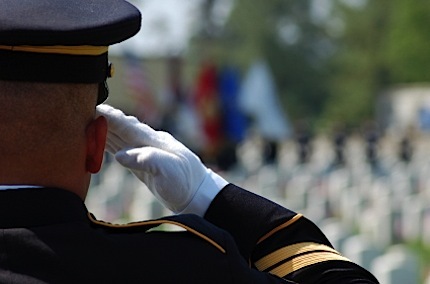 In the meantime kats, let’s not forget the reason the holiday was set to begin with…to remember the brave Jacks and Jills who gave it all to keep America proud, safe, beautiful and free. From the Revolutionary War soldiers to the people risking their lives all over the world today, here’s a big thank you. Memorial Day Weekend also means the hot days of summer are here to stay, at least for a while. In SoFla summer is like winter up north…people stay inside more, but in the AC instead of heat. Of course in our ‘winter’ you can go to the beach or swim in the pool, and you never have to worry about the hot sun melting your car door lock shut like the ice freezes them shut up there. In fact, even on our hottest days if you relax under a palm tree, out of the sun, there’s usually a nice breeze to keep you comfy. Whatever you’re doing today, live it up. It’s a day of remembrance and relaxation, a day to celebrate our freedom by having fun the way America is built to do! It was on May 31 last year that the Wreck Bar’s fate was uncertain. The Sheraton Yankee Clipper closed for extensive remodeling, and no one was sure if the remodel would include the historic bar (themed like a sunken ship) would survive. (see last year’s post here). Well the news turned out to be great…not only did they keep the Wreck Bar intact, they fixed it up, and kept the windows looking out on the pool…so the Mermaids swim again, every Friday evening at five. So if you’re in Fort Lauderdale on a Friday night make sure you stop in and see Marina the Fire Eating Mermaid (AKA Medusirena) and her pod of below-water beauties. They’re a real blast from the past, doing their underwater rumba to great Exotica music, just as if it were 1957! 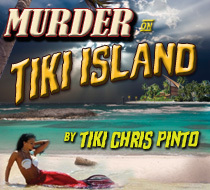 Sure kids, there are dozens of great Tiki events taking place all around the country (and the world), but when it comes to the biggest in the 48 states, none compare to the BIG THREE: The Hukilau in Fort Lauderdale Floirda, Tiki Oasis in San Diego California, and Ohana Luau at the Lake in Lake George New York. Since I live 15 minutes away from Fort Lauderdale Beach, going to The Hukilau is as easy as sipping a Mai Tai under a palm tree. Four days of Tiki themed parties, drinks, films, art, dining and shows will make you feel like you’re in the South Pacific. 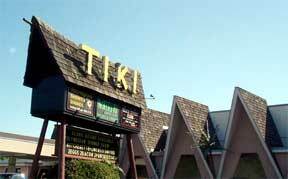 And of course, the world famous Mai Kai Polynesian Restaurant & Tiki Bar (The original from 1956) is included as the main attraction on Saturday night, featuring their Polynesian fire dancers and (what I think is) the best PolyPop dining outside of Hawaii. 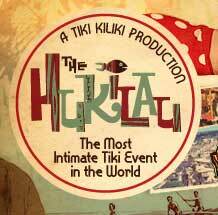 Entertainment at the Hukilau this year includes King Kukulele, The Woggles, Neanderthals, Sweet Hollywaiians, Intoxicators!, Stolen Idols, The Bikini Beachcombers, Walk The Plank, Elena –Hula Hooper Extraordinaire!, Candy Del Rio, Reverend Valentine and South Florida’s own Marina the Fire Eating Mermaid. In between the drinks, music and dancing will be specials guests: Shag – Josh Agle, a book signing by Jeff “Beachbum” Berry, Lu Vickers – The History of Weeki Wachee, DVD of Tiki WORLD PREMIERE – Paradise Lost, Duda Leit Tikimentary – In Search of the Lost Paradise, Art from Harold Golen Gallery of Miami, and Sarong-O-Rama fashion show with Tiki Bree & Sandra Carr. Add to that the room crawl, Tiki Treasure Bazaar and the Master Mixologist Cocktail Challenge and you’ve got one hell of swingin’ Tiki bar party! We’ll be there for the big event on Friday night, all day Saturday and Saturday night for dinner and the Polynesian show at the Mai Kai. Luau at the Lake takes place each year in one of my favorite vacation spots, Lake George, New York at the fantabulous Tiki Motor Inn, a throwback to the golden years of Poly Pop. Lake George Village itself has a very ’50s vibe to it, and it’s not unusual to catch a ’57 Chevy or ’50 Merc cruising the strip on a Saturday night. This year’s Ohana features some great music from Granite Tiki, Bamboo Saxotica, 9th Wave, The Ghosts, Pablus, Waitiki, Fisherman, Jimmy Virani, Francis LLacuna and more. Room crawls and outdoor movies viewable from the pool add to the fun. There’s also going to be a cocktail contest, a mini golf tournament and the Luau Under The Stars…featuring a pig roast, traditional hula and the fire knife dance. And of course there will be a section of Tikirific vendors to grab some hip souvenirs from! Entertainment is wall to wall featuring King Kukulele, The Tikiyaki Orchestra, APE, The Martini Kings, Mimi Le Meaux, Clouseaux, Marina the Fire Eating Mermaid, The Maikai Gents, Lushy, Tana the Tattooed Lady, Project: Pimento, The Hula Girls, Lady Borgia, Thee Swank Bastards, Megan Mayhem, Violetta Beretta and Sultry Savage Burlesque, and Martin Cate. The schedule hasn’t been posted on the website yet, so it’s a sure bet there will be more stuff added to the event. The bad news: These events are almost sold out for 2010. 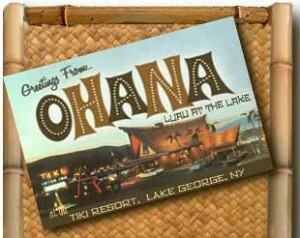 Rooms are totally booked and the goodies like commemorative Tiki Mugs are either gone or almost gone. So why am I posting this now? So you don’t forget to plan for next year, that’s why. No kidding kids, if you can’t get into one of these events this year, start getting the luggage & cab fare together for next year. These things sell out QUICK! In fact, the hotel rooms at Bahia Cabana (the host hotel for The Hukilau) sold out about a week after they announced it, if I remember right. So put it on the books, jump in your jalopy and make tracks! Hope to see some of you at The Hukilau! I’ll be the guy in the Hawaiian shirt. -Tiki Chris reporting from the cabana on the beach, under the hot Florida sun. 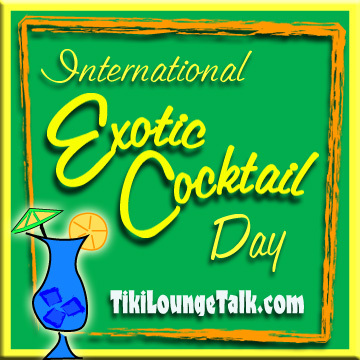 Tiki Lounge Talk is the place where mellow Tikiphiles meet swingin’ kats and kittens. Pull up a cocktail, lay a Les Baxter platter on the hi-fi and get into Retro & Tiki Culture and swing with kool kids! Ker-razy, man! was going to slip through Mod Movie Monday! 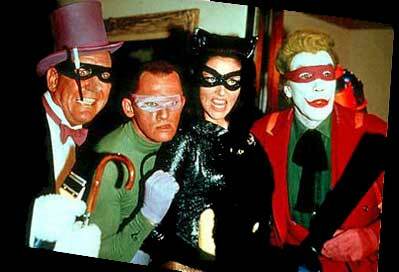 For those of you who think Micheal Keaton made the first Batman movie, take a little history lesson from the Tiki Lounge. Back in 1966 Adam West, the 60’s TV series’ Batman donned the first modern Batsuit and dropped the hammer on the first mod Batmobile for the silver screen. 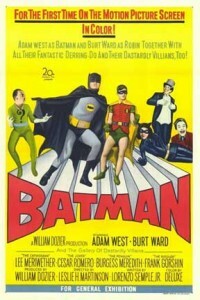 Just like the TV show, Batman, The Movie was filmed in that kookie comic-book style with vivid colors, wild angles and all sorts of mod 60s toys. They pretty much crammed as much stuff into this movie as they could, giving us not one, not two but FOUR villains, The Penguin’s Submarine, The Batmobile, The Batcycle, The Batcopter, The Batboat, and lots of shots of the Batcave. There are so many groovy scenes in this movie I couldn’t possibly mention them all. Just get it and watch it, I guarantee you’ll dig it. It’s silly, it’s funny, it’s action-packed and has great special effects (like the rubber shark). Hell, it’s worth it to ogle Lee Meriwether! Plus there are lots of shots of the infamous Chuck Barris Batmobile (see Barris’ video on building the original car below). 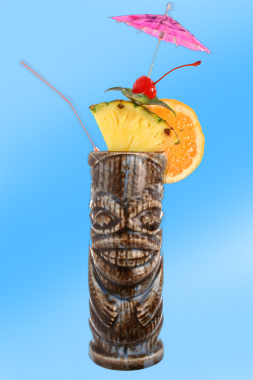 In a tall glass filled with ice add rum, grenadine, three drops bitters, and fill with OJ. With long picks arrange the pineapple wedges onto the orange slice so they look like bat ears, and use for garnish. 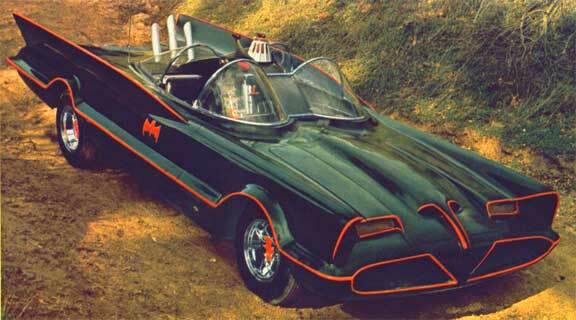 To make a Batmobile Cocktail, float 151 on top and set the whole thing on fire. 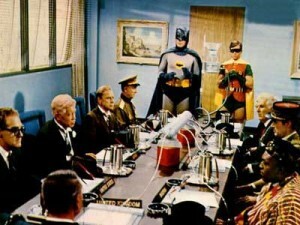 For dinner, since you can’t really eat a bat, or a robin, I’d suggest some other winged creature. Perhaps penguin. No, I guess you can’t really do that. Besides, they don’t have wings anyway. How about Pheasant Under Glass, like Bruce Wayne? Forgetaboutit. Just make chicken. Serve it on some really colorful plates and napkins (you can get wild colors at the party store) and don’t skimp on the gravy. That’s right kats and kittens, May 22nd means I’ve had this beauty for 20 years on the button. That’s half my life, by the way. Longer than I’ve known my wife and most of my friends, longer than I’ve been able to legally drink. You’d think by now it would be done! But when you have an antique car that you work on yourself, you’re never really finished. The short story is, I bought her at a yard sale in a little community that went by the name of Birdland in South Jersey, and drove it home. Within a few months I’d added a set of tires, rebuilt the carb, got the brakes working, put new seat covers, installed a new fuel pump and did some bodywork, enough to get her primed. By summer she was on the road. 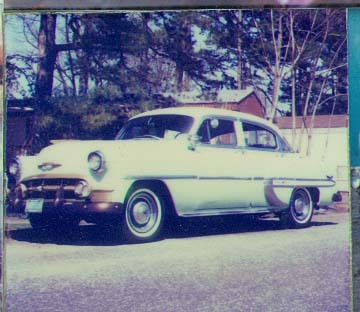 I drove her around primed gray for over a year while I got the lettuce together to get her painted, and by September 1991 she was seafoam green with a white top and chocolate interior. I drove it around like that for ten years, to fun places like Wildwood and Cape May, Ocean City and Smithville, NJ. Then in June 2000, we moved to Fort Lauderdale, Florida. StarDust came with us on a flatbed behind the 22′ moving truck. Once down here (with a two-car garage) I decided to totally re-think her, make her a wild custom ride. I started with engine – adding a 4-banger carb and headers with duals to the original six, then cut the top like a cabriolet, then…the FINS. 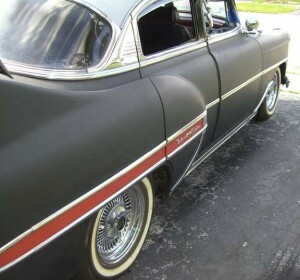 Yes kids, in true 1950’s custom fashion, I hand-built 33″ fins on the back of this baby, working them into the contours of the car. 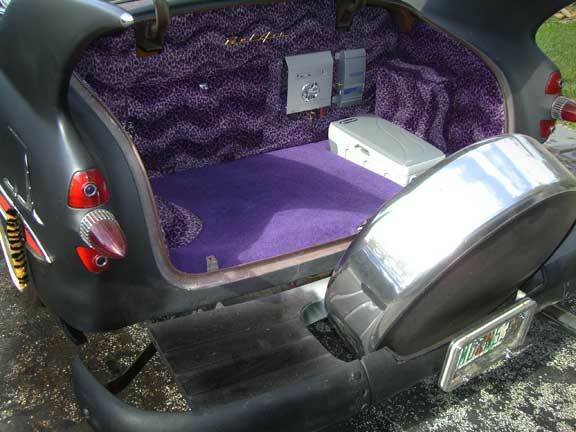 Then I installed the leather seats from my Father’s Cadillac in, added a purple rug and custom center console with a pop-up DVD player, and chrome spokes. Recently I rebuilt the braking system from the ground up, and added a new high-torque starter to make her start up easily and more reliably. She’s running great now, and looks decent although she’s still in black primer (I plan to paint her metalflake candy purple before I kick the bucket). I’d really like to put a Mustang II front suspension and a dual master cylinder on her in the near future, but that front end’s more work than I can handle myself. I’ll have to take it to a shop for that, and frankly I ain’t met no kats in SoFla that I’d trust her with! Twenty years is a long time to have a car. I have a feeling this car will outlast me. 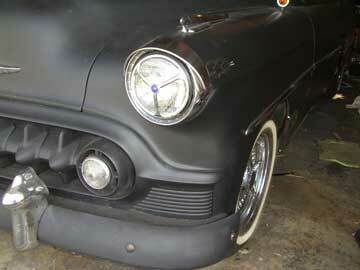 I have a lot of neat pix and info on how I built it at the StarDust Chevy website, http://53ChevyHotRod.com. Check it out if you have some time. It’s a gass, baby! 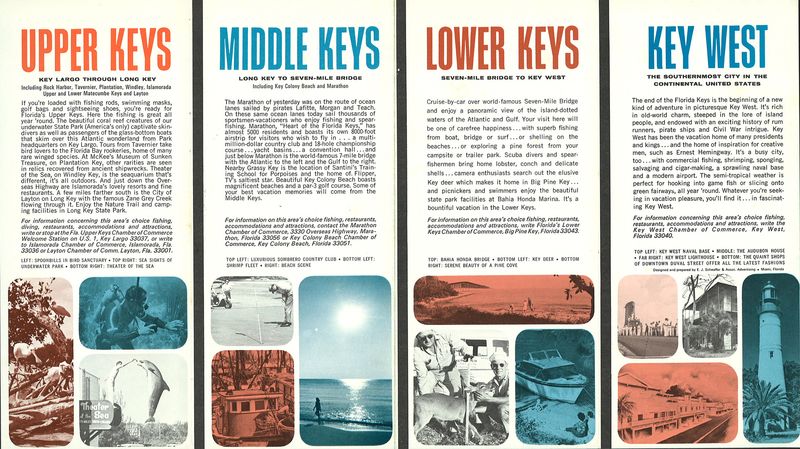 Key West Brochure, c. 1960s. Click for hi-res version. Time to hop in the convertible and motorvate down along the Overseas Highway Kids! Just imagine dropping the top on your ’64 Cadillac deVille, tuning in the AM radio to some groovin’ Rock ’n’ Roll station and swingin’ down along A-1-A from Miami to US 1, all the way down to the southernmost point of the continental United States. You stop for a burger and Mojito at a roadside Tiki stand, buy a couple of stuffed baby alligators and cruise over the Seven Mile Bridge into the land of palm trees and sailfish. Click on the pix to enlarge them enough to read the copy. It’s pretty neat. 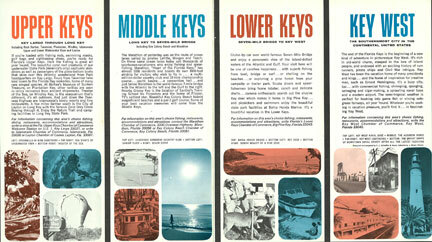 I especially dig the hand-painted artwork of the Keys map. We just don’t build stuff like this anymore. Sure, CGI is fantastic…but it doesn’t have the feel of the old, hand-produced stuff. Just imagine..an artist had to paint this, then a team of graphic artists had to do mechanicals, color separations, cut rubies, hand-set the type…oof, I’m gettin’ a headache just thinking about it! Something like this would have taken weeks to produce in the 60s. 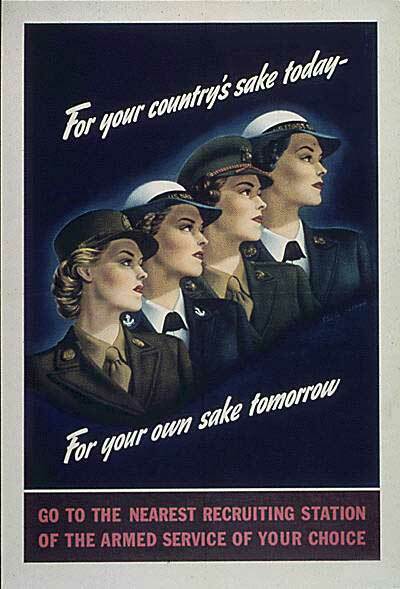 My my my how times have changed, huh kids? Here’s the map on the back of the brochure. Below is the copy on the inside. -Tiki Chris, reporting from somewhere lost in the Keys, near a Tiki Bar with a giant lobster out front.